Yes, another chili recipe. This one is mostly from scratch, tho. Inspired by a combination of different recipe concepts and what I happened to have available. My original plan was to make buffalo chicken chili. However, we didn't have any bleu cheese. Not completely foiled, cheddar would still do. I also didn't have a proper wing sauce, so I used hot pepper sauce and compensated by frying the vegetables in butter instead of oil. Then the issue of what to serve with it arose. We've had a lot of rice lately, so I suggested pasta. Of course, chili served on pasta and topped with cheese is really Cincinnati-style, so suddenly Cincinnati and Buffalo had to hash it out. I thought the sauce turned out a little thin, however, I opted to not add any tomato paste. I also thought that the chili needed more spice. I added additional sauce when I served it. It could simply be because of the sauce I used. I'll leave it up to your own personal tastes. 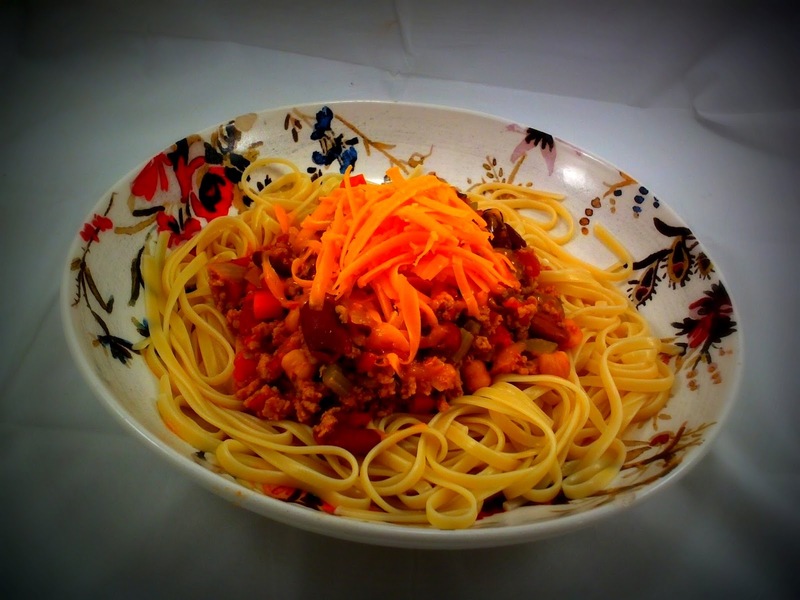 Cincinnati chili is served on pasta and topped with lots of cheese. It's a great alternative to tortilla chips. 1. brown the ground chicken, garlic, paprika, oregano and cumin in 2 tbsp oil over medium-high heat, using a potato masher to evenly break up the pieces.Set chicken aside.2. Heat on medium and add onions, celery and carrots. Let simmer until tender (10 minutes).3. Transfer the chicken back into the pan and add the tomatoes, beans, and hot sauce and bring to a boil.4. Reduce heat to medium-high and let simmer for 30 minutes to reduce the liquid.Serve on top of pasta, topped with cheese. I was just telling the hubs the other day that we needed to try Cincinnati Chili because we've never had it before ... Looks great !